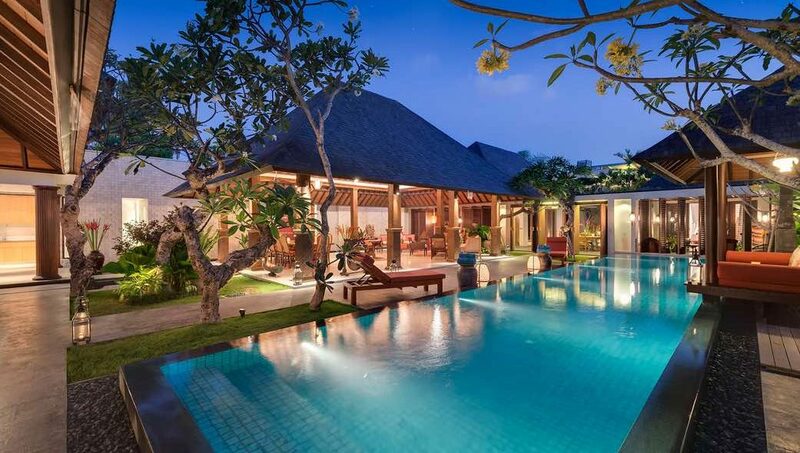 From $ 1,396AUD per night We have direct contracts with most villa owners. We don't add any booking fees. We are 100% transparent with no nasty surprises. ONLY 300 metres to beach - rent this now! 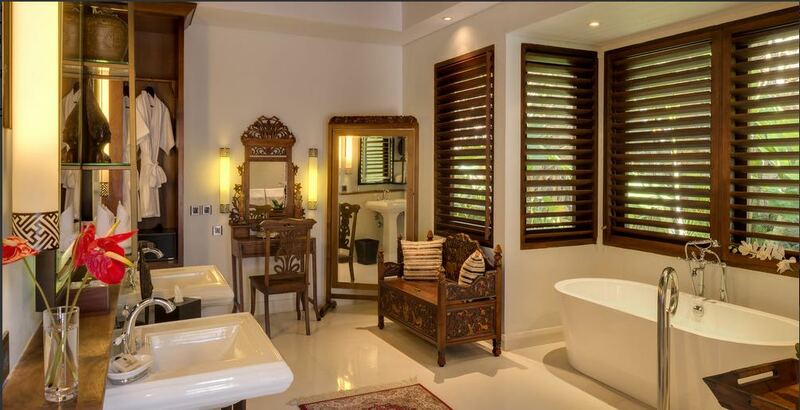 Villa Des Indes 2 is a luxury 5 bedroom Seminyak holiday villa rental situated in the private Laksmana Estate. 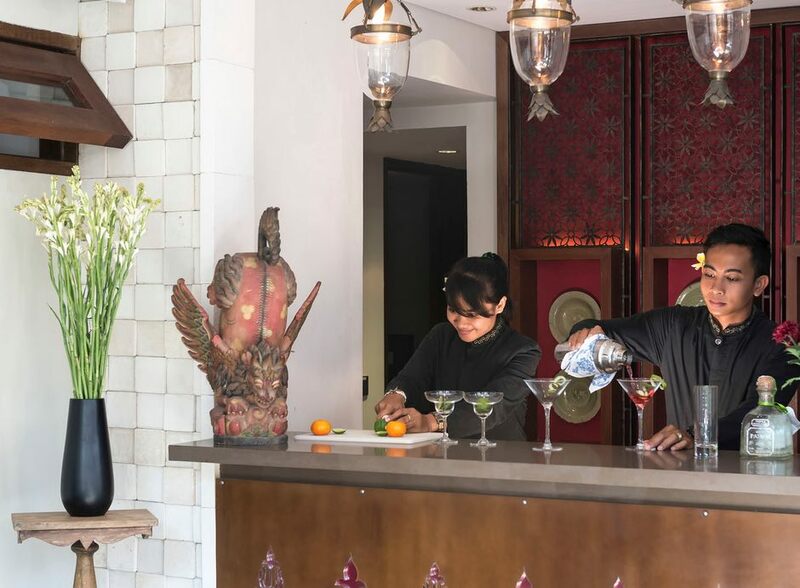 It’s in Seminyak’s most sought after location, ‘The Golden Triangle’ which is located just 5 mins walk from the beach and the best restaurants and beach clubs off Jalan Kayu Aya (Eat Street) and Jalan Kayu Jati such as Ku De Ta, Potato Head, Mrs Sippy and La Lucciola. 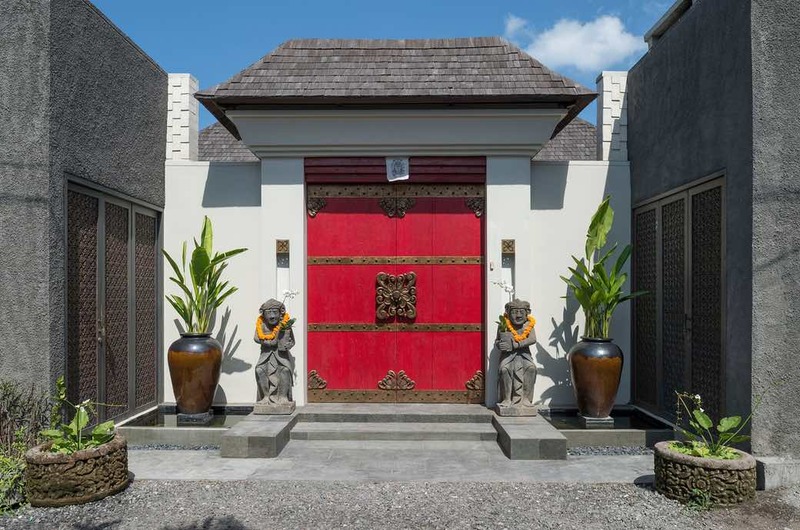 This holiday villa sleeps 10-14 guests and offers an eclectic mix of Balinese architecture and décor, a gentle insert of old-world charm, along with contemporary tropical design elements, making this a holiday home fit for any holiday maker wanting a bit of luxury on their Bali getaway. 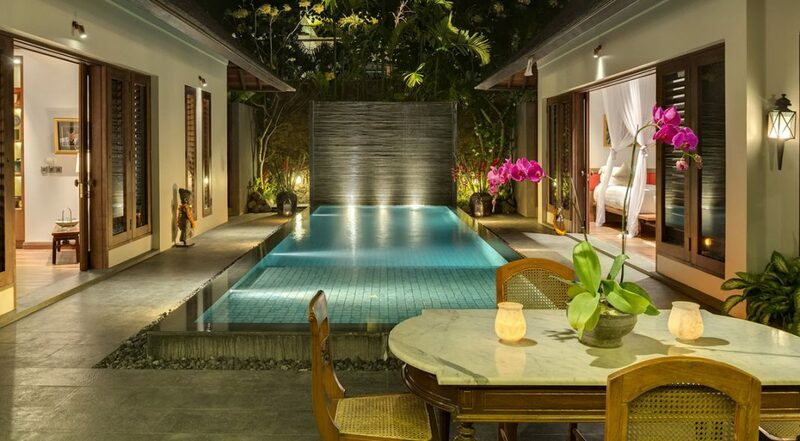 Guests at Villa Des Indes 2 will have the luxury of not 1 but 2 private swimming pools. 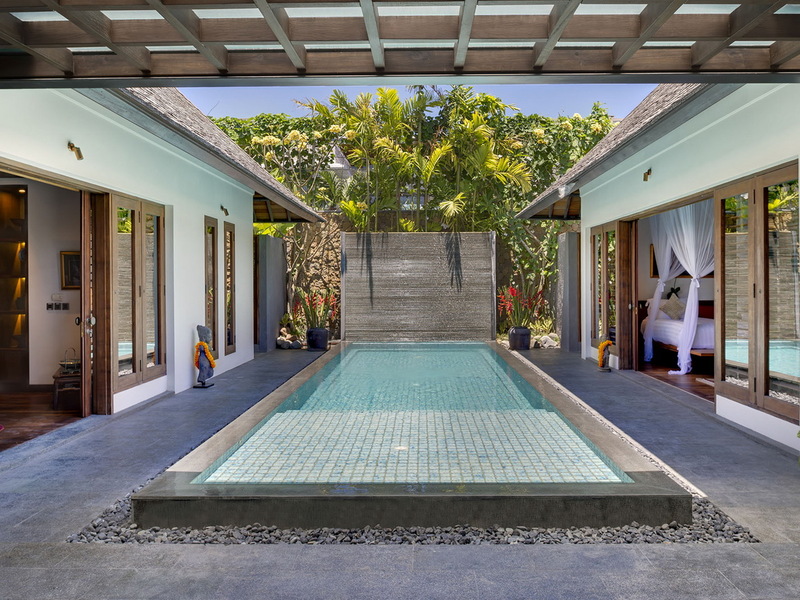 The larger pool is a whopping 16 metres in length and the second smaller of the pools is 10 meters in length with a depth of just half a meter in the shallows making it ideal for the young ones to paddle around. 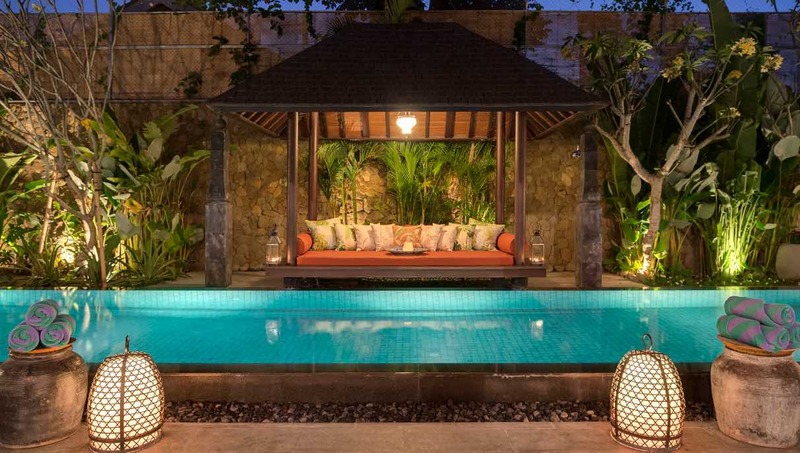 The larger pool is great for swimming laps, the large poolside bale is comfortably cushioned where you can relax in total bliss, read a book, order a snack, maybe take a traditional massage, the options are endless by the pool here. 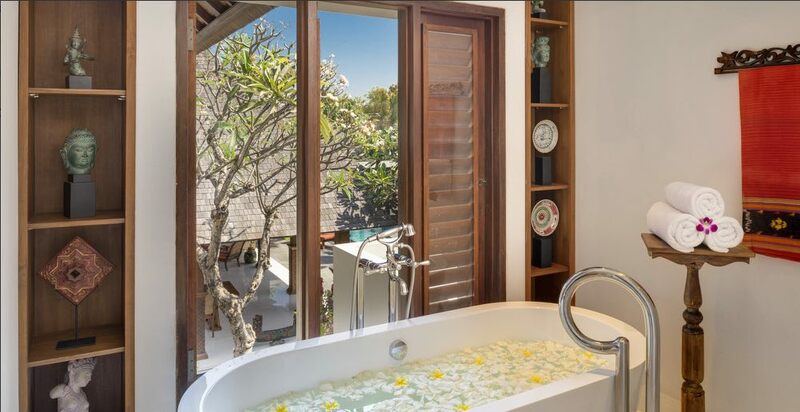 A 3 meter wall, the alluring scent of frangipanis and the pavilions shingled roofs set a wonderful Bali holiday scene. 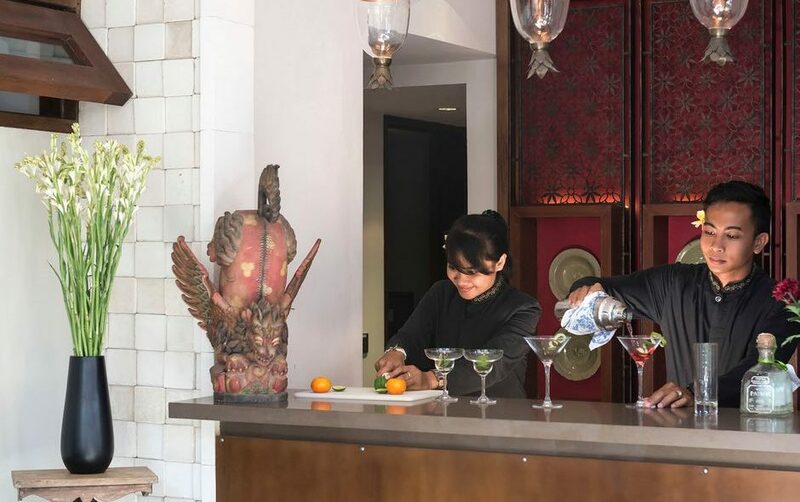 Sit back in one of the finely woven antique arm chairs under the beautiful high vaulted thatched ceiling as the butlers prepare your favorite style of Martini at the cocktail bar. 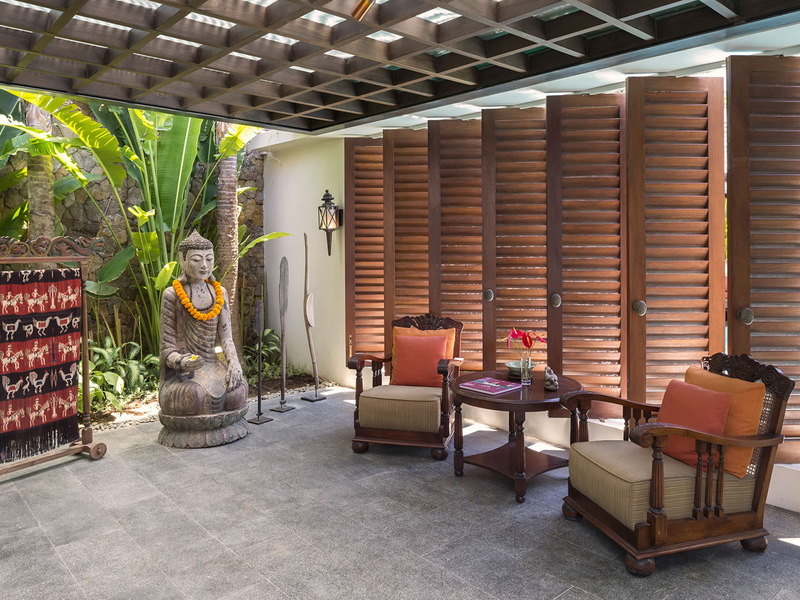 The living areas are housed in open-air pavilions, cooled by large ceiling fans with the option of two lounge areas, a dining table to seat 10 guests, a very well equipped commercial style kitchen equipped to cater for large groups and parties. 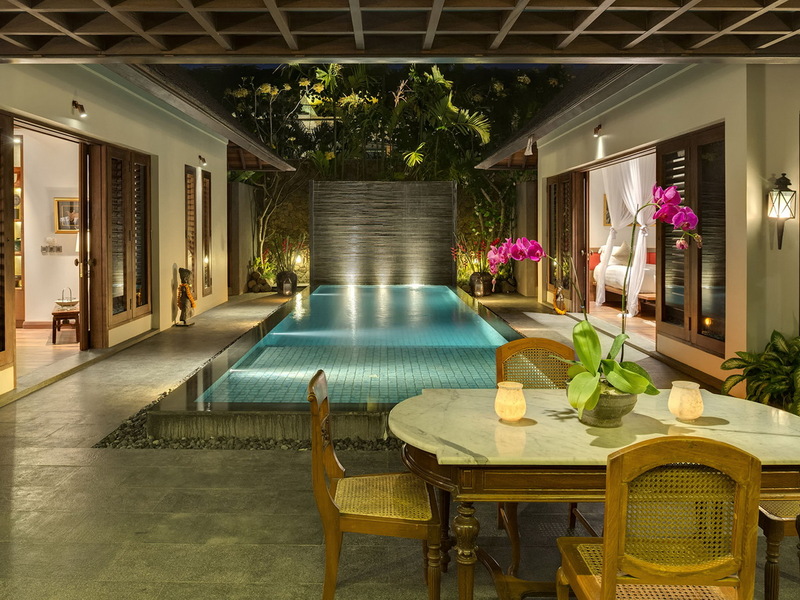 There is an additional living are with adjoining dining area al-fresco style under a large pergola right by the side of the smaller of the two pools. 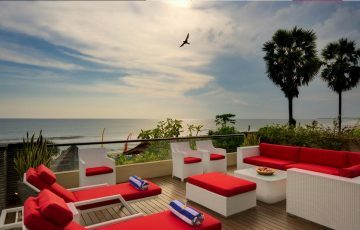 There is plenty for the entertainment enthusiasts with a 47 inch state-of-the-art TV with satellite channels, plenty of books and magazines to choose from and an amplifier with a high-tech BOSE sound system as well as fibre optic internet connection with Wi-Fi. 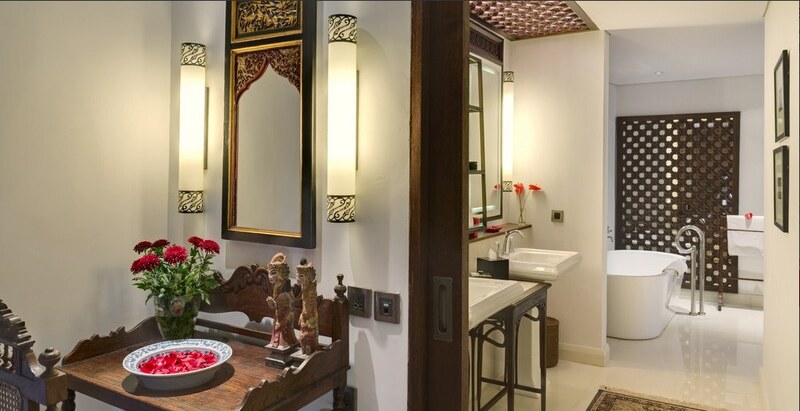 The villas five bedrooms are totally lavish with Italian marble finishes, a collection of Asian artifacts and ornaments as well as floor rugs from around the Orient. 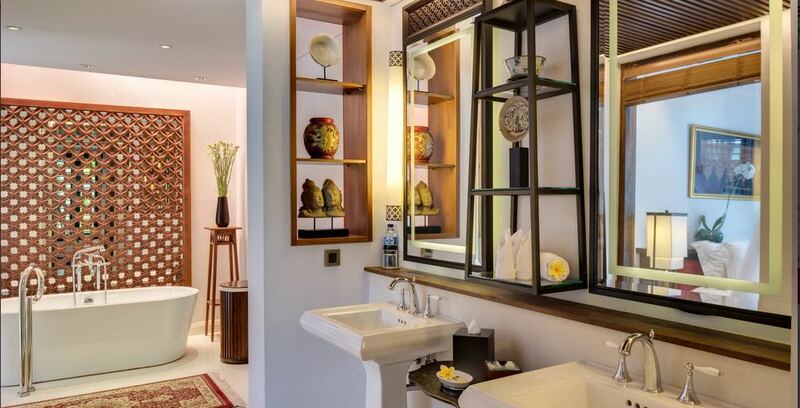 Guests will also enjoy contemporary comforts such as LED TV’s with international cable channels, a range of branded toiletries, rain showers and beautiful white antique soaking tubs where you could quite happily soak in for hours. 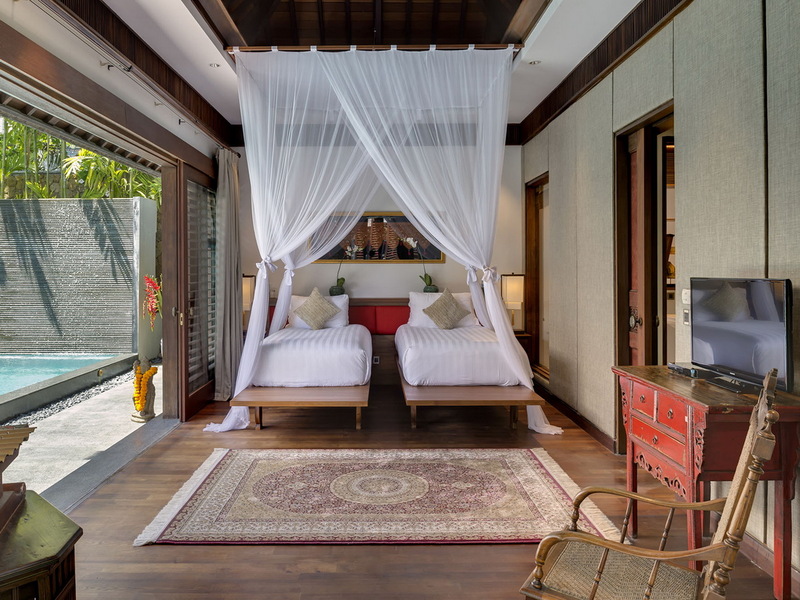 All rooms feature premium king sized beds with one room offering king twin configuration, 4 of the 5 bedrooms can also have an additional king single bed upon request taking the potential total occupancy to 14 guests. 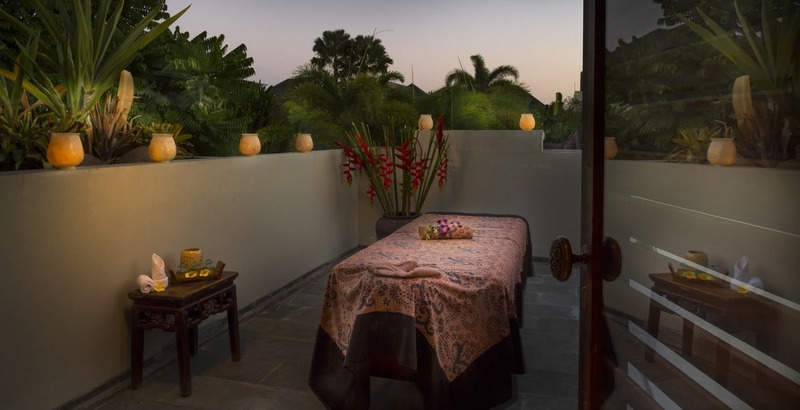 Villa Des Indes 2 is fully serviced by a professionally trained team of friendly Balinese staff who will go out of their way to make sure your Bali holiday is totally memorable and relaxing. 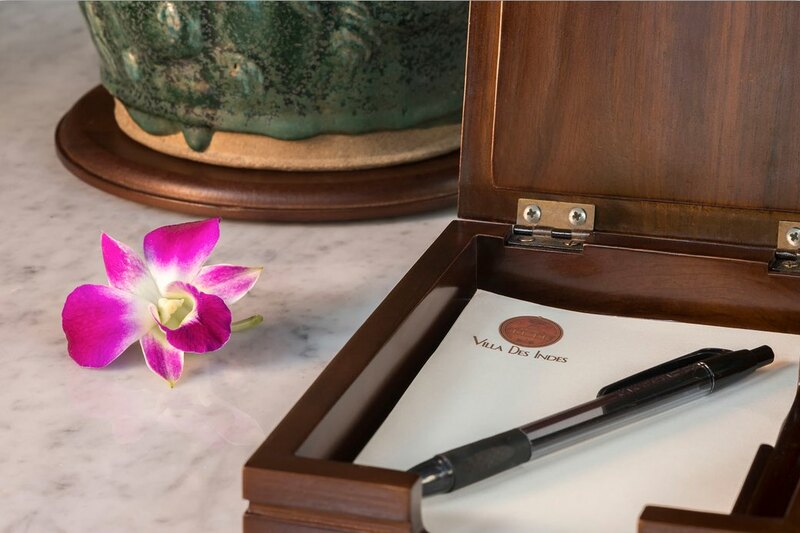 The villa manager is always contactable and the villa’s staff will clean the villa each to suit your daily schedule and remain out of sight to ensure your privacy remains paramount during your stay. 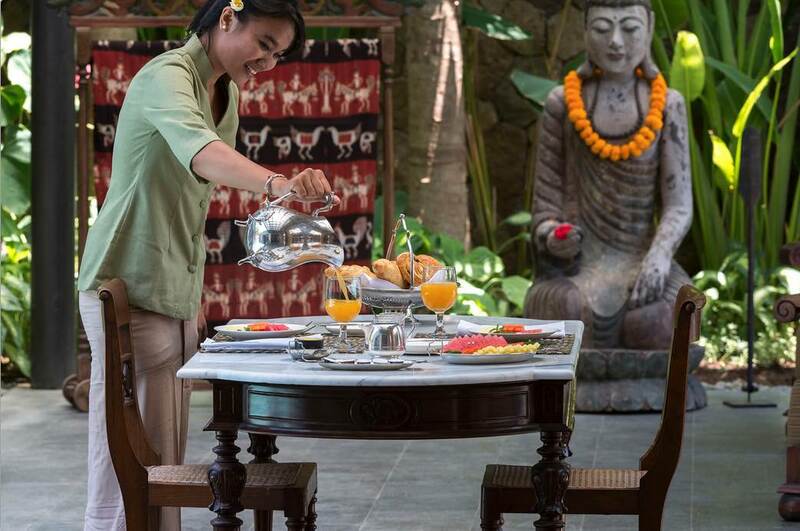 You will receive attentive service from the manager, private chefs, personal butlers, house maids and security staff. 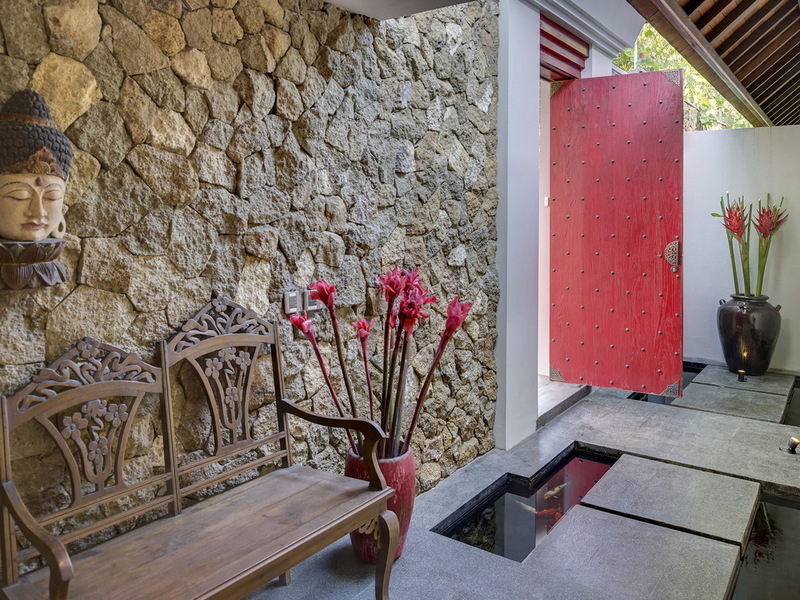 The villa is strategically located in the exclusive Laksmana Villa Estate just off Jalan Kayu Aya where you ware just a 300 meter walk to Ku De Ta Beach Club and the beach at Petitenget or Seminyak ends. In the mornings stroll down to Sea Circus for some smashed avocado on sour dough and the best coffee. 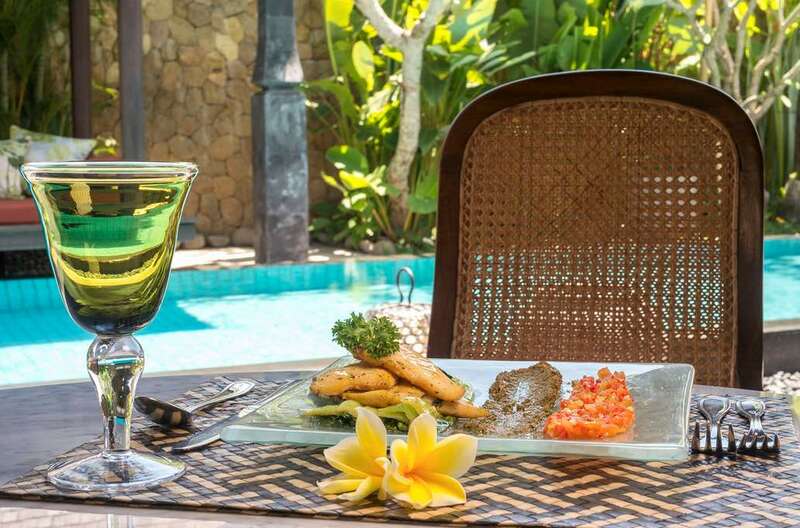 For lunch head over the road to the beach for a super lunch at La Luciola with a glass of chardonnay and an extensive menu combined with ocean front views. 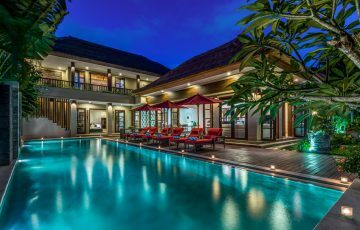 Just behind the villa is Seminyak Square and the new Seminyak Village shopping centre with supermarkets ATM’s, cafes and a lots of more great dining venues for the family. For the kids the Waterbom Park & Finns Recreation Club are close by. 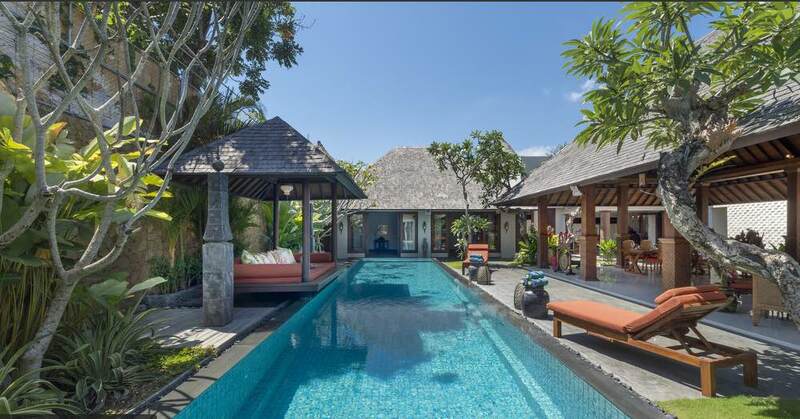 To view other similar 5 bedroom luxury Seminyak Villas or see more family or group friendly Bali Villas near Eat Street, please browse this website or contact our reservation team. 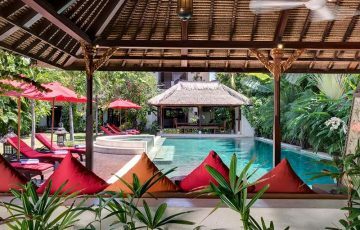 Book your Seminyak holiday at Villa Des Indes 2 well in advance as this is a really popular villa, especially if your planning a trip to Bali during the Australian school or public holidays. 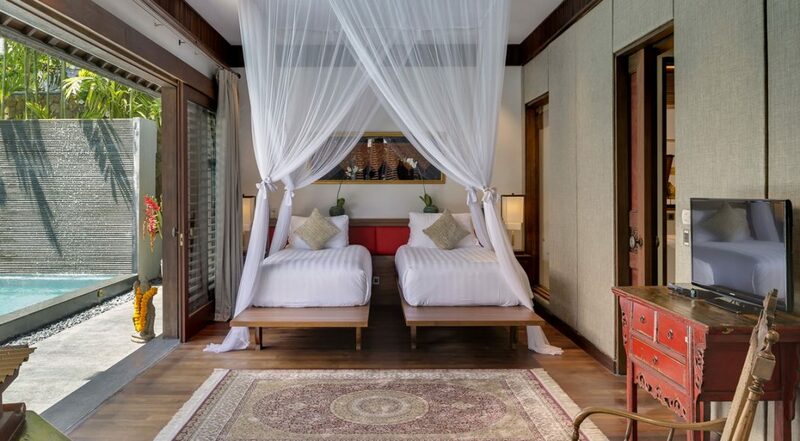 CAPACITY : 10 adults (5 bedrooms: 4 with king-size bed, 1 with twin convertible to king); extra beds may be set up on request (additional charge applies). 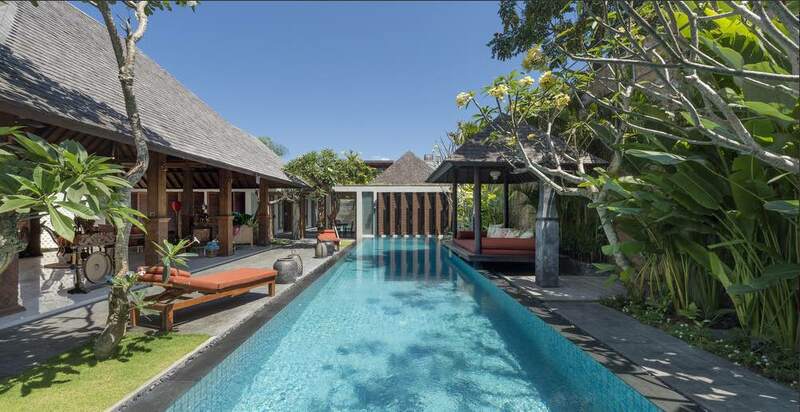 LIVING AREAS : Large fan-cooled open-sided living pavilion with two seating areas and dining table for 10; poolside balé with comfortable cushions; bar terrace with seating; well-equipped kitchen; second living area and dining pergola alongside the smaller pool. SWIMMING POOL : Main pool:16m x 4m. 0.8m-1.7m depth; Secondary pool: 10m x 3m. 0.5m-1.6m depth. 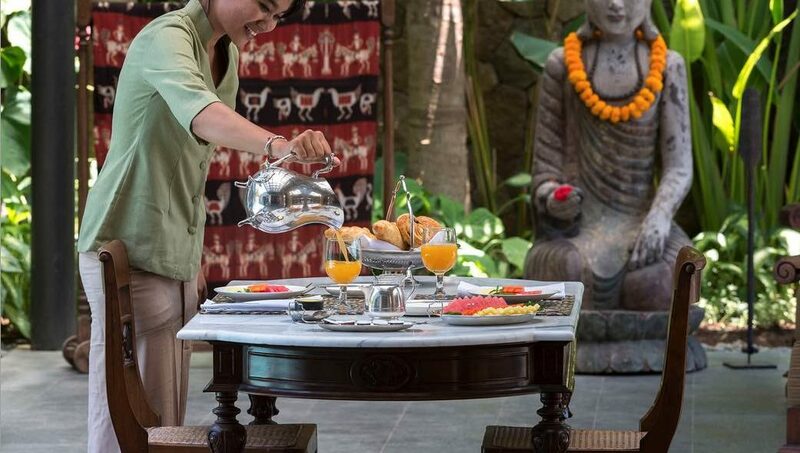 DINING : Breakfast is complimentary; priced menu of Western, Asian, vegetarian and children’s dishes for lunch and dinner; requests accommodated (including special diets). COMMUNICATION : Fibre-optic internet with WiFi; landline for local calls (international calls charged); mobile phone coverage; PABX system with connections in all rooms; printer and fax (on request). 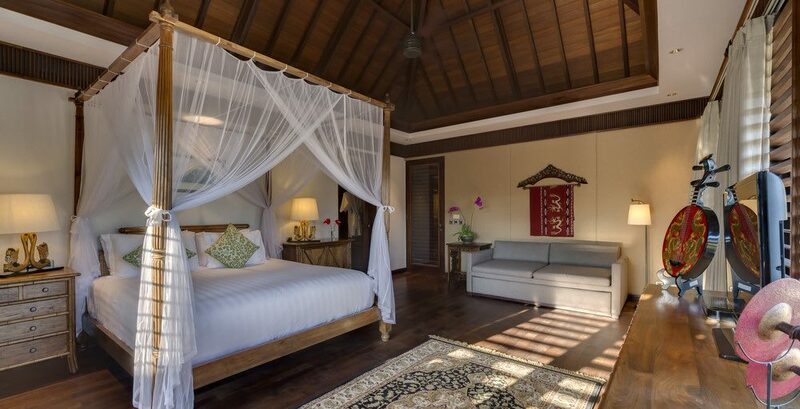 ENTERTAINMENT : 47-inch curved TV with satellite channels in four bedroom; 43-inch TV in one bedroom; DVD players in all bedrooms; amplified and Bose speakers in living pavilion; books and magazines. 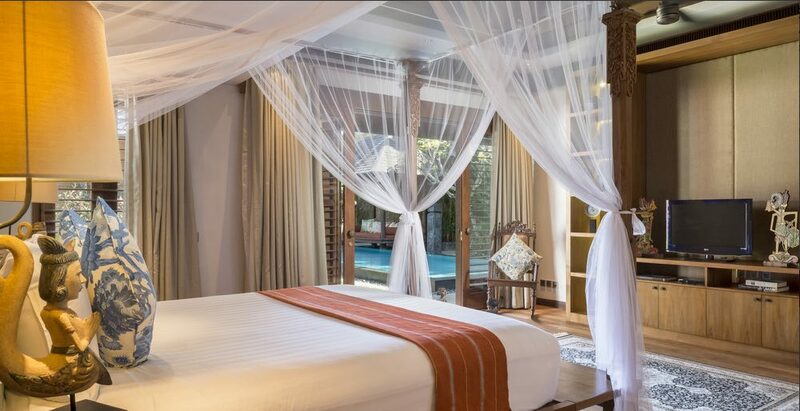 FOR FAMILIES : Des Indes II makes a great villa choice for families. Equipment at the villa includes a baby cot and high chair. Many other items (including booster seat, baby bath and pool fence) can be supplied on request for a small additional charge. 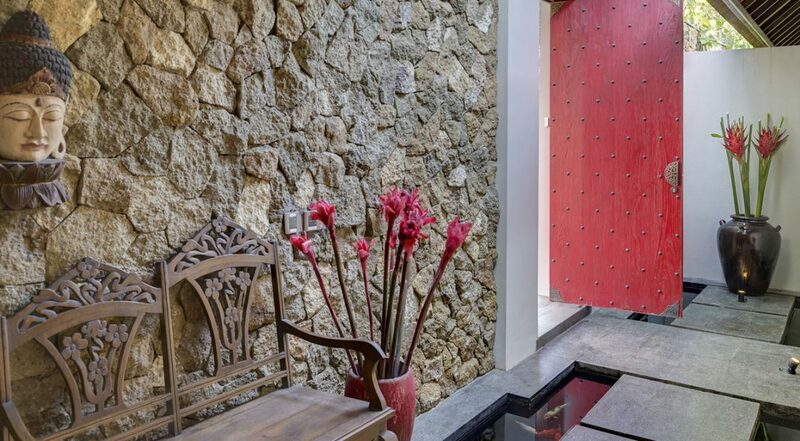 TRANSPORT : The villa’s central Seminyak location means many attractions are within easy walking distance. 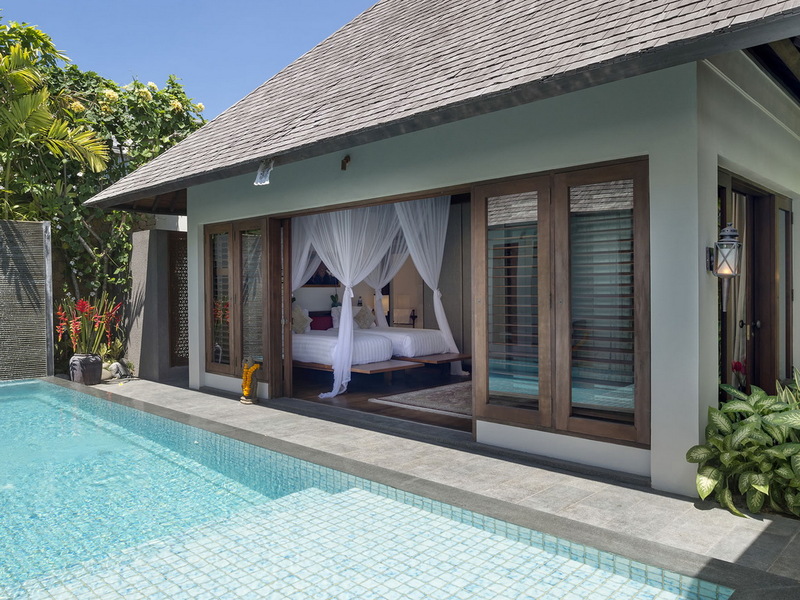 If transport is required, the villa manager will happily call one of the island’s safe and reasonably priced metered taxis, or organise the hire of a car and driver. PROPERTY AREA : 1,080 sqm (land); 515 sqm (build). 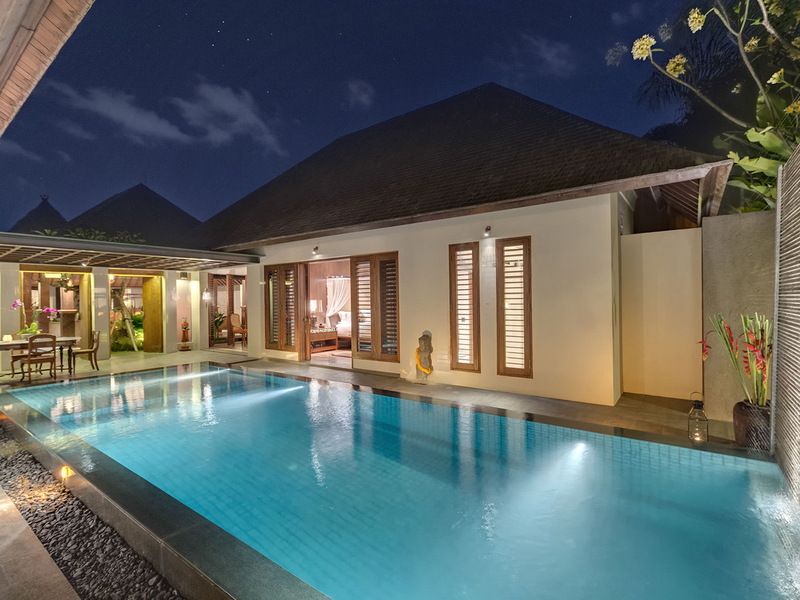 STAFF : Villa manager; assistant manager; chef; cook;, butlers/housekeeping; garden and pool staff; maintenance; security (night-time only at villa, 24-hour for estate). Additional staff (babysitters, masseuses) available on request. 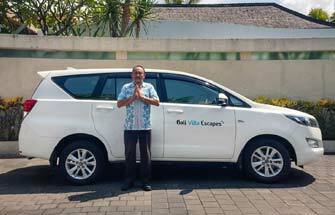 We cannot thank Dewi at Bali Villa Escapes enough for organisng this amazing Villa Des Indes 2. It was like a wonderful dream! 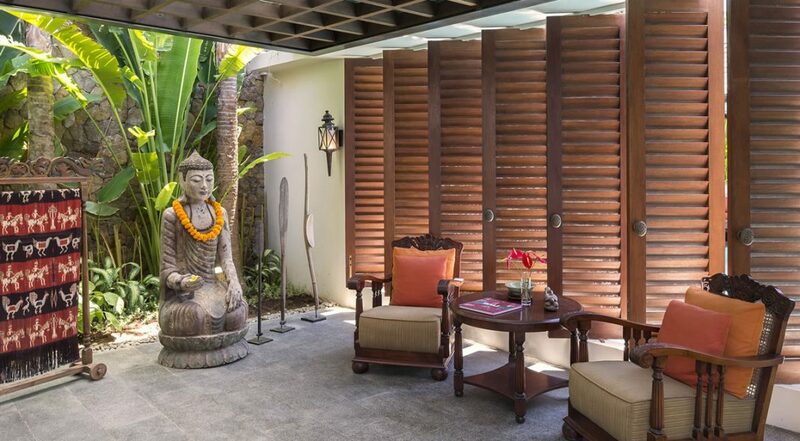 A fantastic location backed up by lovely facilities and gorgeous surroundings. 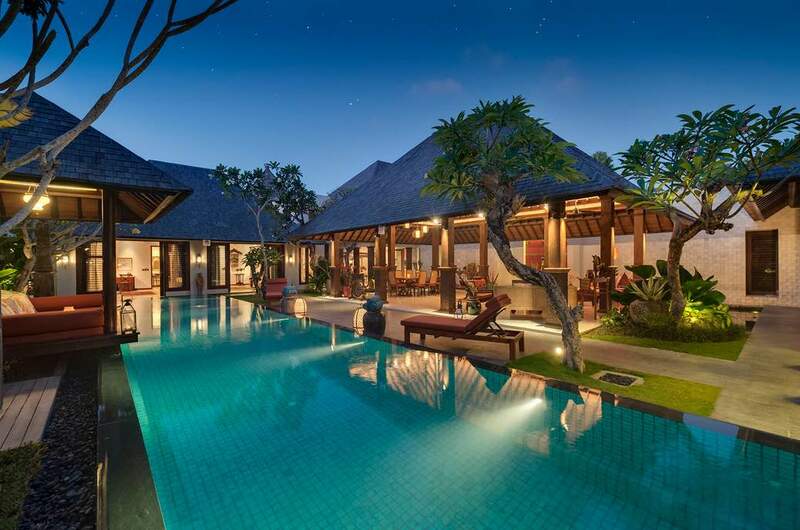 I have already recommend this villa to a friend who wants to take her family here. Im happy to give this a 10 out of 10. 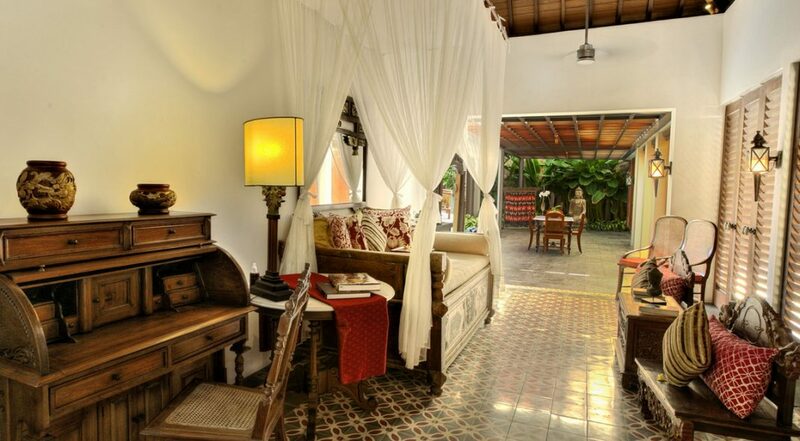 Lovely memories of our holiday in Villa Des Indes 2 when we were in Bali. 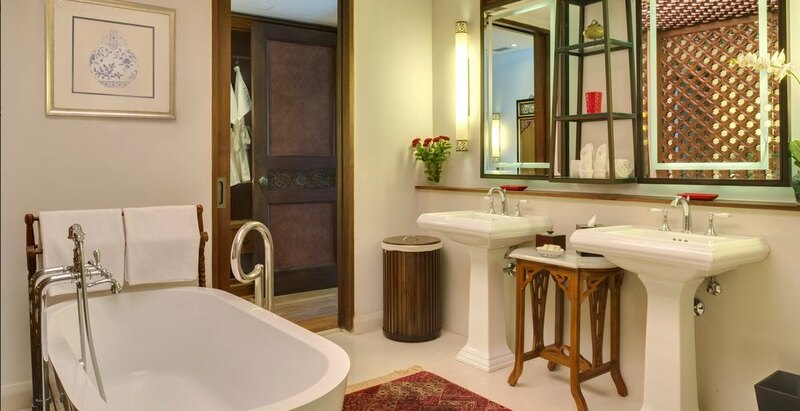 Luxurious, spacious with the finest details thought of. So modern and comfortable it was really hard to drag ourselves away. 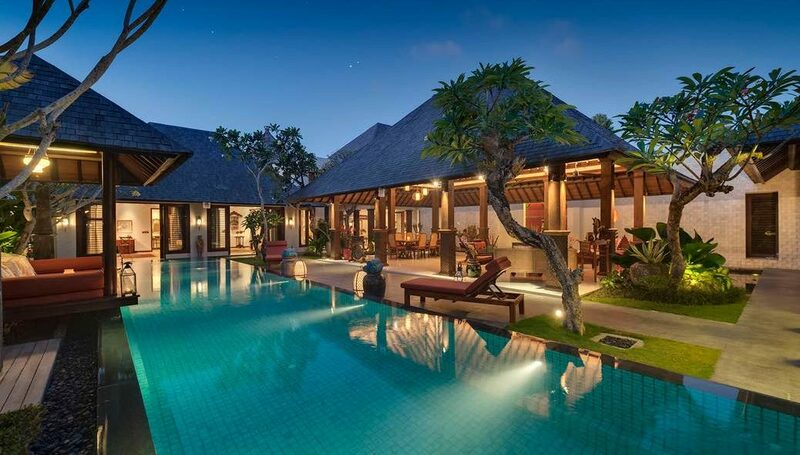 The central location in Semiyak did mean that we could go out for dinner for a few nights but we much rather hang in the villa with our family and have the chef prepare a meal for us. We felt so spoiled. 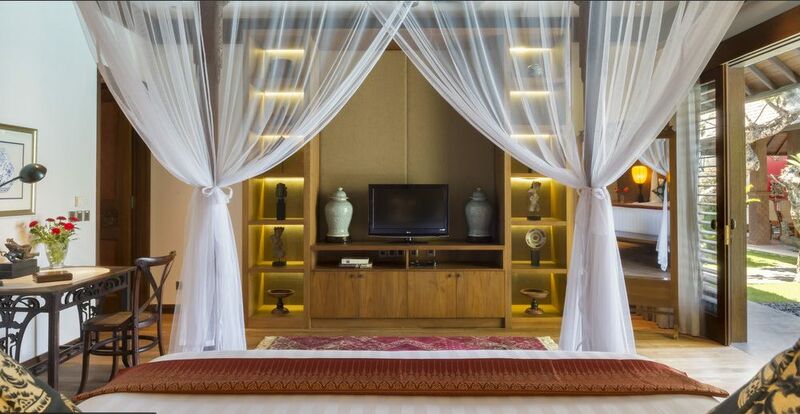 All the rooms were well appointed and had a TV which was perfect if we wanted to have some privacy and let the kids play in the lounge room - staff were happy to watch over them. 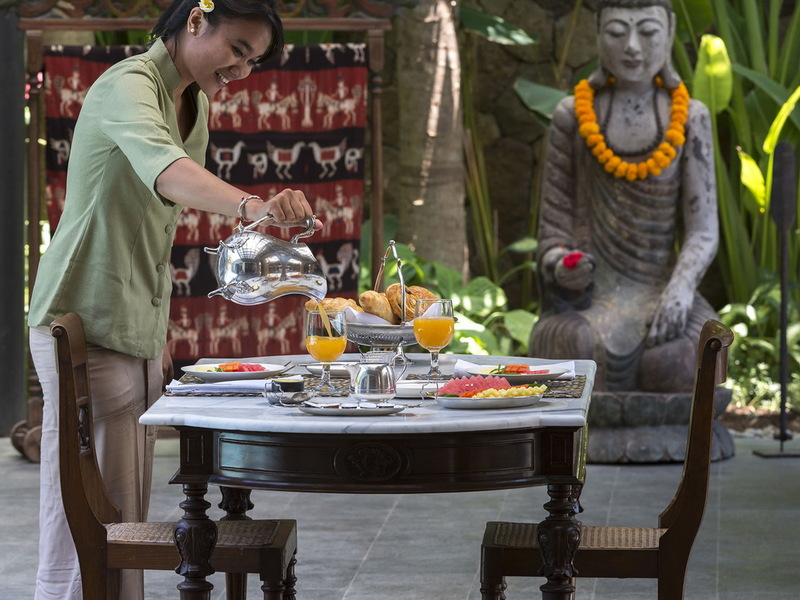 We have stayed previously in villas before and have found that the staff can be a bit lazy but not here at Des Indes 2. These guys know customer service better than anyone. 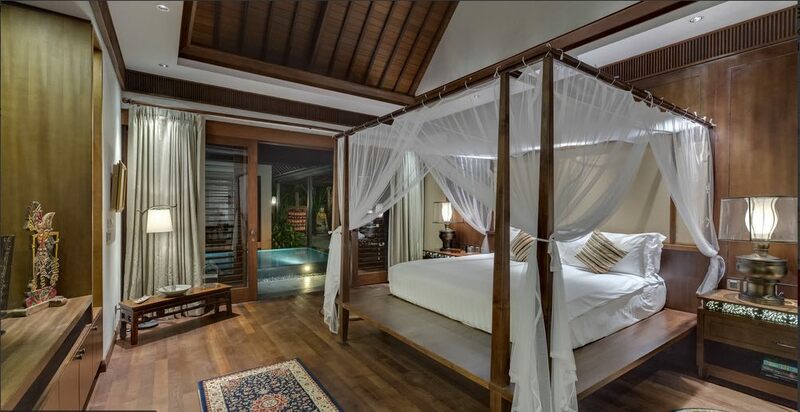 We would highly recommend anyone to stay here. 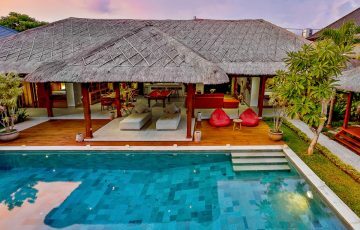 One of the best villas we have ever stayed in Bali - luxury all the way and so worth it! 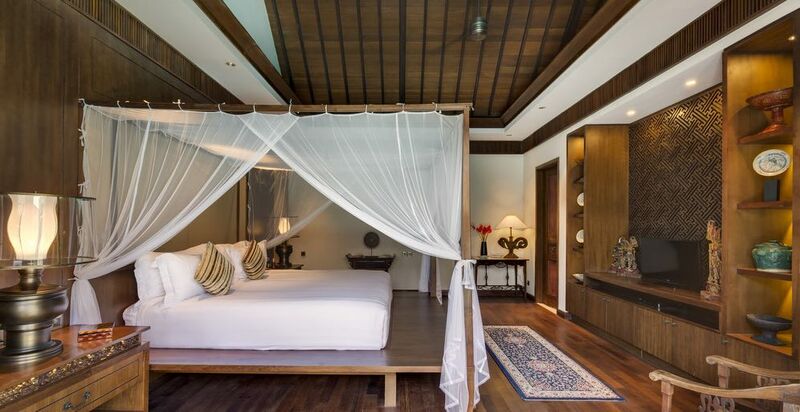 Do yourself a favour and stay here, you will absolutely love it. 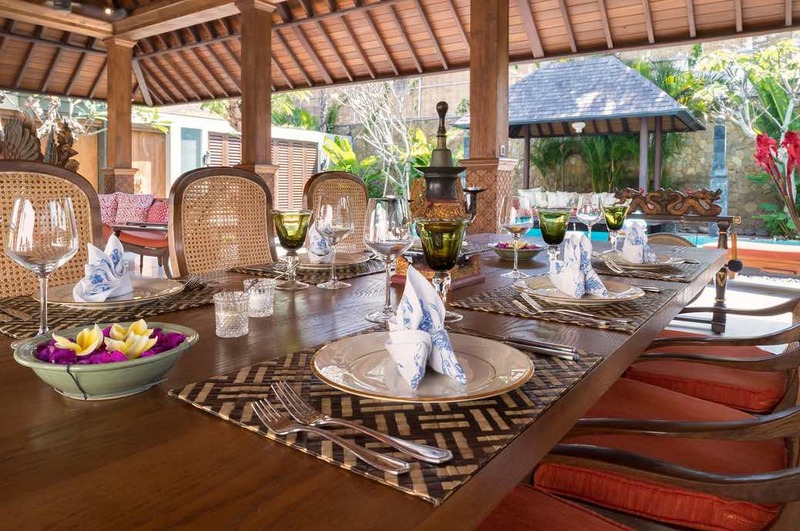 Having your own chef was such fun for the family who enjoyed the most amazing Indonesian dishes for lunch and dinner. What a top location. 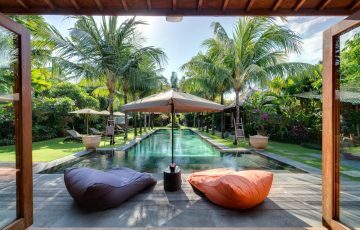 Close to Sisterfields, Ku De Ta and Seminyak Village. 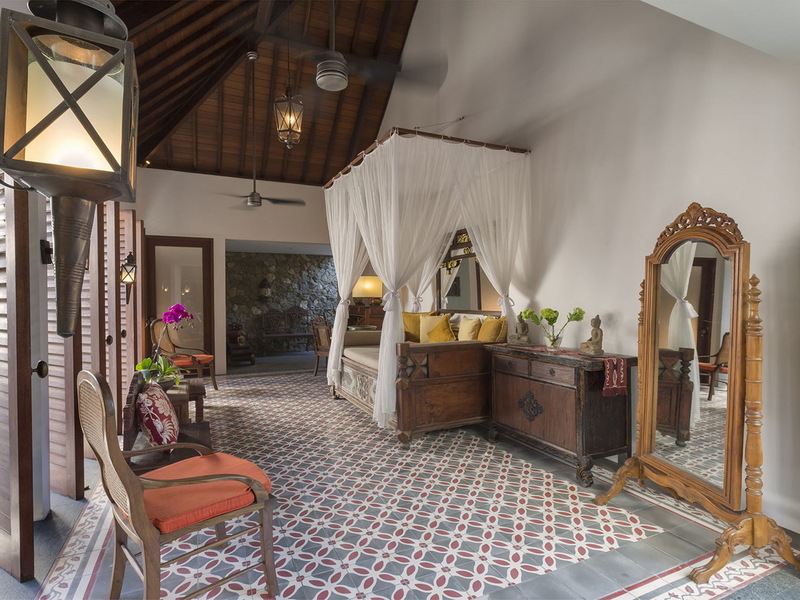 We couldn't believe how lucky we were to stay here. As soon as we arrived and saw our exact location we were so keen to explore the area. 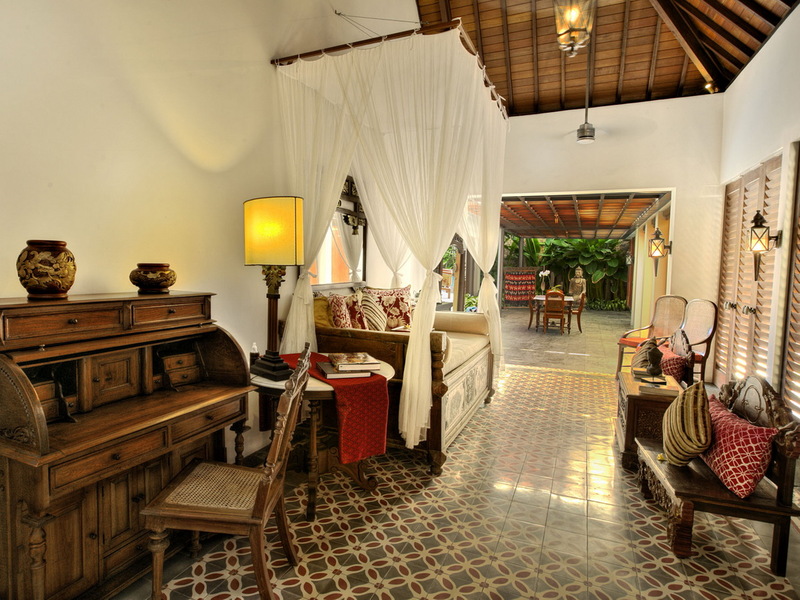 So many fab little cafes and places to hang out and enjoy the Seminyak buzz. Villa staff were perfect and made our stay even more wonderful. This is one holiday we will remember for a long time with fondness. 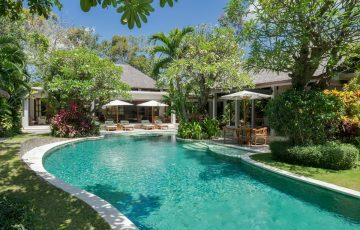 Spent 10 days here with our 4 children and can only thank Putu, Wayan and the rest of the staff at Villa Des Indes 2 for a LOVELY holiday. We will be back.